It’s been awhile since I’ve gotten new workout shoes. My old shoes were the same style and brand that I’ve worn since high school – high school! (To clarify, it’s not the same SHOE, as in shoes that are now 15 years old, oh gosh…has it been that long? 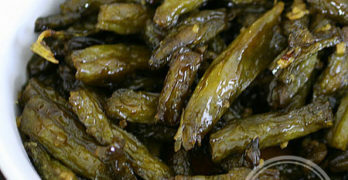 ?…but the same style and brand.) They just seemed to work and so I stuck with them. Admittedly, my shoes were a little past their expiration date. If you do a lot of running, you should get new shoes every 300-400 miles, depending on running surface and your weight. For my old shoes, I knew my size and knew how the shoe would fit, so I would buy them online. I continued my online shoe-shopping strategy when I shopped at Famous Footwear. I’ve never bought shoes from Famous Footwear before, but loved that they had multiple brands and styles to choose from. I wear a size 8, and oddly, that size always seems to be sold out. Famous Footwear had my size in every shoe that I considered. They also had a cool “Fit Assitance” download that allows you to print out a guide to help you find your shoe size. I totally love the pink on these Reeboks. 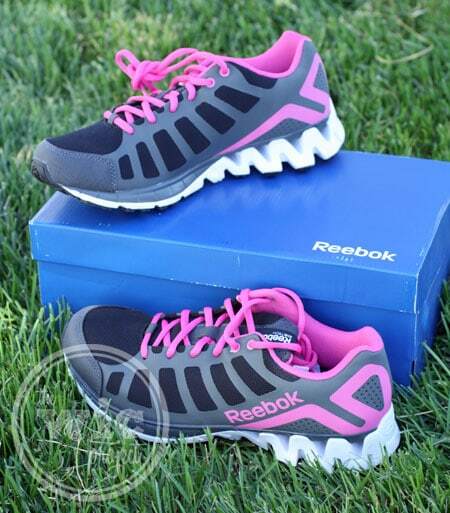 This online shoe shopping trip was for some Reebok shoes that would work both for my workout runs as well as walking around. 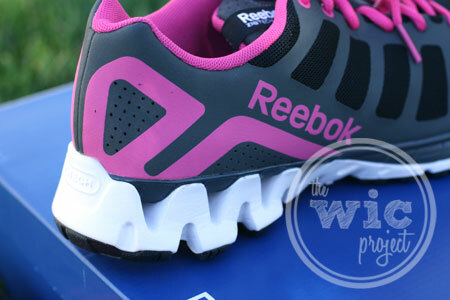 Reebok has several shoes that are in fun, vibrant colors. After reading the user reviews, I finally opted for the Reebok Women’s Zig Kick. I loved that the colors made it wearable around town and the hint of pink suits my style perfectly. Even better was that the shoe was on sale, so I was able to purchase a pair of shoes for Gil as well. I’ve never worn Reebok workout shoes before so I was interested to see how they would compare to my old shoes. As soon as I put them on, I immediately noticed the weight difference. These shoes were much lighter in comparison to my old shoes, and when you’re talking about miles of running, you can really notice a difference if your shoes are lighter or heavier. I also really liked the fit of the Reebok Zig Kick running shoes. They fit true to size and weren’t too wide or too narrow for my foot. They fit securely, but not tightly, and had nice support around the ankles. This is what ZigTech cushioning technology looks like. These shoes have great treads for trail and road runs. Overall, I had a very positive shopping experience at Famous Footwear. 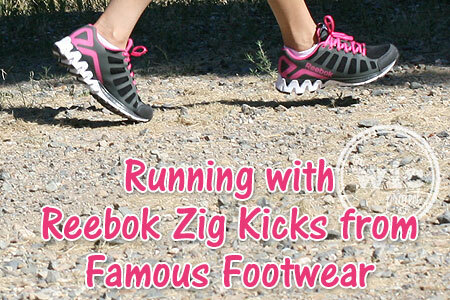 They have a wide selection of athletic shoes, sandals, and other footwear at amazing prices. The shoe reviews were very useful, not only because there were a lot of reviews (which means lots of feedback) but also because the reviews covers not only the style and sizing, but performance and support as well – important factors when it comes to workout shoes. I’ll definitely be checking out Famous Footwear and Reebok the next time I need new workout shoes, but until then, I’m hitting the trails. Disclaimer: I participated in a campaign on behalf of Mom Central Consulting for Reebok. I received a Famous Footwear gift card to purchase a pair of Reebok shoes to facilitate my review and to thank me for participating. Those are some good looking shoes. I like the color and they look sturdy and comfortable. besides that I have always liked Reebok tennis shoes. Those shoes actually look comparable to New Balance. I may have to reconsider my loyalty to the brand.